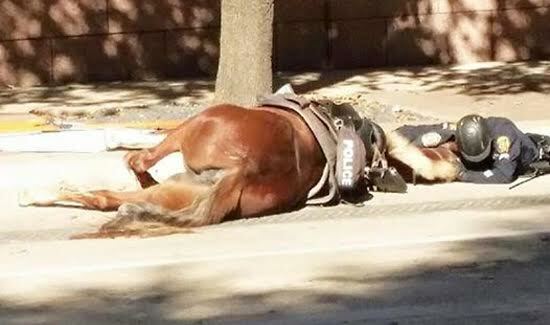 A photograph showing a police officer comforting his dying horse in her last moments is attracting a lot of attention onlin—and causing a lot of people to reach for their Kleenex. Charlotte, a horse that served with the Houston Police Department for four years, was struck by a truck. Her partner, Officer D. Herrejon, is pictured embracing her. We’ve always said we support ALL animals, and know the relationship with those animals & their person is an incredible thing. Yesterday, here in Houston, a police horse was spooked, bucked the rider & ran into the street where it was unfortunately then hit by a truck. The amazing part of this tragic story is what its rider did while he lay in the street. This is a pic of the officer laying with her while she took her last breath. We admire the heart & strength of this officer because as you know, when you lose an animal, to be with them during their last breath is a heartbreaking & tough thing to do. Thank you to him for loving his partner & friend until the end. Our hearts go out to him & the HPD family. RIP Charlotte. “She loved her job and was always ready to go to work putting bad guys in jail or giving nuzzles to children,” the department wrote in a follow-up post.